For many Aussies, the day starts with the aroma of coffee beans and frothing milk in one of thousands of cafes across the country. And for the theatre and anaesthetics teams that start at an early hour, the coffee ritual before work is routine. The instant coffee at the Hospital hasn’t quite hit the mark for these coffee specialists, and a coffee run and order was soon placed. Being the ever helpful logistics guy, this one seemed like a piece of cake. Up the road to “Friend’s Cafe”, pick up the coffee and head back. At Friends, I meet ICU nurse Sally. I had planned to pick her up from there anyway and take her down to the Hospital. Sally had decided to shout the ICU staff and had already ordered 10 lattes! So I added a few to the order, and we calmly waited for the 14 coffees to be made while we watched the world go by in Nuku’alofa. The coffees arrived and the stark reality of transporting 14 coffees suddenly hit. Delivered in a makeshift box with lids kind of secured, Sally and I quickly decided that we needed to make sure everything was secure, and the first spillage occurred. Steaming hot coffee into the cardboard box now rendered it useless, the structural integrity was gone! Box number 2 and lids as secure as possible and we were on our way. If you know Nuku’alofa, you’ll know their roads are not at the standard to expect, and dodge-the-pot-hole is the name of the game. Transporting 14 steaming hot coffees now had taken on a misson of critical care, needing the steady eyes and hands of a cardiac surgeon! Past pot holes, avoiding dogs, and around roundabouts at the stunning speed of 30 kilometres/hr (the speed limit is 50km is town), we made steady progress towards the hospital. Overtaken by a bicycle rider and a car on the main street of town is an achievement, sure we were going slow, but slow and steady was going to win this race and avoid 3rd degree coffee burns. Finally over the last bumps, we negoitated the hill into the carpark with the precision of an anaesthetist putting in patients lines and drips. As the rain started to fall, we negotiated a seamless transition from passenger to driver of the coffees and ooutside the car. A brief walk, 4 flights of stairs and through 3 doors, and we’d made it – to the theatre tea room. No burns, no scars, stress levels high, but high-fives and success! 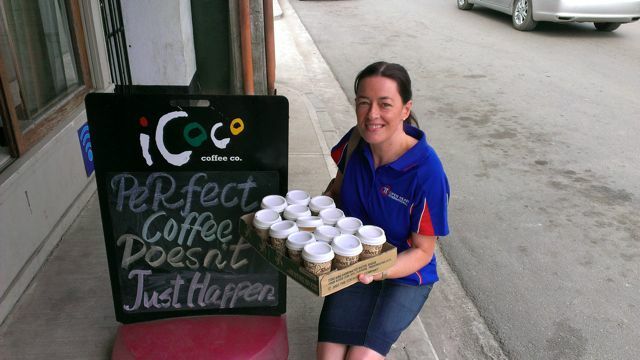 Well done Sal – great coffee delivery team!